This breed served on small boats, called rijnaken, that were usually found on the Rhine River. 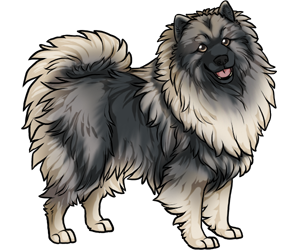 The origin of the Keeshond is most likely Arctic or Sub-Arctic and it shares ancestry with the Samoyed, Chow Chow, Norwegian Elkhound, Finnish Spitz, and Pomeranian. Keeshonds used to be the symbol of the Patriots in the 18th century but when the Prince of Orange established his party as the dominant party, not many wanted the breed that stood for the opposition. Only the most loyal continued breeding, as there was a very low population of this breed until 1920. In 1920, the Baroness of Hardenbroek became interested in the Keeshond. Within 10 years she brought the breed to a solid position and the Dutch Keeshond Club was established. The Keeshond was registered in the American Kennel Club in 1930. -The plural of Keeshond is Keeshonden. -The Keeshond originated in Holland.